For all their attempts to tout their accomplishments, the current FCC under Chairman Ajit Pai is failing miserably at the their promise to shrink the digital divide in America. In a recent commentary in The Hill, policy and program manager for Next Century Cities Cat Blake explains how, rather than reducing the gap between Internet haves and have-nots, policy changes under the new administration is making the problem worse. Cat offers a few specific examples of policies and actions taken by the current FCC that have not only aggravated the problem of digital inclusion, but masked the realities of its severity. That 95 percent, however, includes 10.5 million people who have access only to satellite service, which was not considered an adequate broadband connection under former FCC leadership….The agency’s documented expansion of broadband is actually the result of an explicit decision to lower federal standards of acceptable service, as opposed to a change in the amount of Americans actually served by high-speed internet….In addition, the report counted 24 million Americans without access to fixed broadband. As Blake notes, it’s much easier to claim victory if one changes the rules of the game to make themselves the winner. Anyone who’s ever depended on satellite Internet access knows that it’s unreliable, expensive, and inadequate for today’s needs. With data caps and often long-term commitments, rural residents with only satellite Internet access as an option should not be considered as “served” by the FCC. Pai’s beloved BDAC has been under fire for multiple reasons and policy analysts question their recommendations. Unfortunately, Pai stacked the committee with industry representatives and much of its work benefits the industry’s interest in turning a profit, as opposed to actually making broadband more accessible….Instead of encouraging deployment, this committee has worked to limit local communities’ ability to solve the problems that the market (and FCC) won’t. “Model legislation” from the BDAC strikes at local authority and clearly puts more negotiating power into the already heavy hands of the big cable and telephone monopolies. Ever since the FCC repealed federal network neutrality protections in 2017, communities have searched for local solutions to protect themselves from the odious control of national corporate ISPs. Many have investigated methods that the BDAC have tried to stymie with their recommendations. Blake and other policy analysts who are concerned about shrinking the digital divide remembered what Pai said soon after his appointment. He said that he and the FCC were “going to be busy.” He was right; the changes his FCC have implemented are creating more challenges for Blake and others who actually care about shrinking the digital divide. 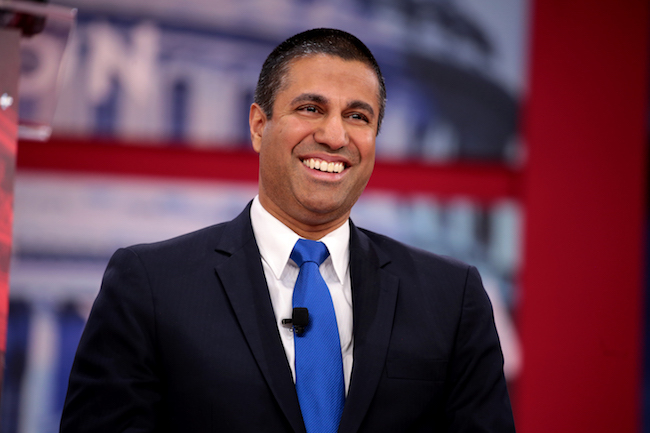 Image of Ajit Pai at the 2018 CPAC Convention by Gage Skidmore from Peoria, AZ, United States of America (Ajit Pai) [CC BY-SA 2.0], via Wikimedia Commons.